The Islamic State militant group (ISIS) has claimed responsibility for a deadly shooting spree in Toronto, the first claim this year in North America. The jihadis' official Amaq News Agency released Wednesday a statement claiming that Faisal Hussain, 29, was acting on behalf of ISIS when he opened fire on a busy street in the Danforth neighborhood of Canada's most populous city. The attack killed an 18-year-old woman, a 10-year-old girl and injured over a dozen others in what ISIS described as an answer to the group's calls for attacks on citizens of countries involved in a U.S.-led coalition bombing the jihadis in Iraq and Syria. "The person who carried out the attack in the city of Toronto in southeast Canada this past Sunday evening was a soldier of the Islamic State and he conducted the attack in response to calls to target nationals of the coalition states," Amaq wrote, attributing the statement to an ISIS security source. Authorities were skeptical, however. Hussein, who was found dead in the area after a shootout with police, "had severe mental health challenges, struggling with psychosis and depression his entire life," according to a statement sent by his family to CBC News. While Police Chief Mark Saunders told the outlet Monday he was "looking at every single possible motive for this," he cautioned citizens on Wednesday from accepting unofficial evidence from outside sources. "Since Sunday evening, all areas of the Toronto Police Service have been involved in this investigation. We have received assistance from law enforcement partners at every level and I have been updated regularly," Saunders said in a statement provided to ABC News. Related: Toronto Shooting: Does Canada Have a Gun Control Problem? "At this stage, we have no evidence to support these claims. Accurate information about this investigation will only be released by the Toronto Police Service. We will continue to explore every investigative avenue including interviewing those who knew Mr. Hussain, reviewing his online activity, and looking into his experiences with mental health," he added. Hussain's deadly rampage was caught on video. 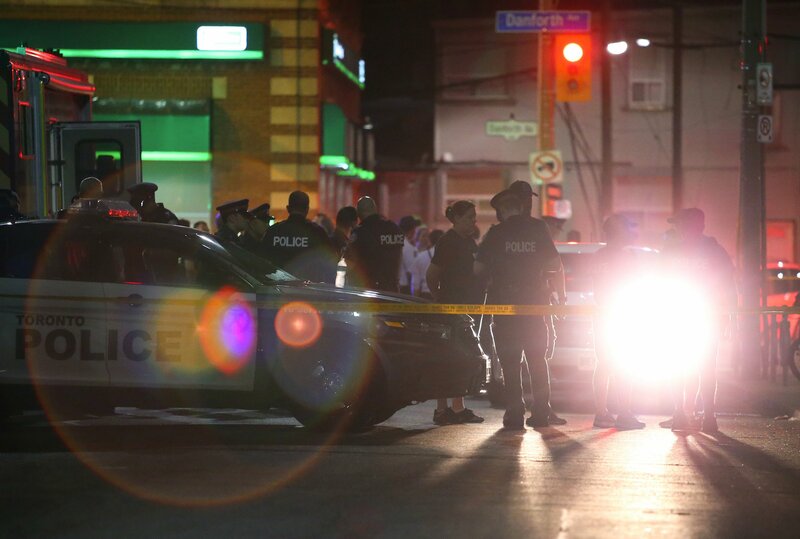 In one bystander clip, the all-black-clad gunman can be seen walking down a street in Toronto's Greektown before pulling out a handgun and firing several shots off-camera. ISIS-related attacks in Canada are rare, but not unprecedented. Three prior incidents have been linked to the group, which arose out of the post-U.S. invasion chaos of Iraq and later spread to Syria in 2013. The group's elusive leader Abu Bakr al-Baghdadi announced in October 2014 the group would become a global caliphate and Canada joined a U.S.-led coalition to bomb the group, which had taken nearly half of Iraq and Syria. Later that month, 25-year-old Martin Couture-Rouleau deliberately rammed his car into two soldiers in Quebec's Saint-Jean-sur-Richelieu, killing one and injuring the other before being shot dead. The government said there was clear evidence he had been "radicalized" prior to the attack. Two days later, 32-year-old Muslim convert Michael Zehaf-Bibeau shot dead a Canadian soldier near a war memorial outside the Canadian Parliament in Ottawa and injured up to three others before being shot dead himself in what was said to be a second ISIS-related assault. The latest incident in Canada took place September of last year, when Abdulahi Hasan Sharif, 30, allegedly used his vehicle to ram Edmonton police constable Mike Chernyk, stabbing him upon exiting the vehicle. Sharif fled the scene and managed to hit four other pedestrians, but was eventually arrested. All survived the incident, and an ISIS flag was found in Sharif's vehicle. A month later in October, ISIS claimed responsibility for Stephen Paddock's massacre in Las Vegas, the deadliest shooting in modern U.S. history. However, authorities have yet to find any jihadi links. Two more ISIS-related attacks have occurred in North America last year, both in New York City. The first was Sayfullo Saipov's Halloween truck-ramming that killed eight and the second was 27-year-old Akayed Ullah's failed pipe bombing in December, in which only he was seriously injured.